El último número del National Geographic Magazine dedica su editorial y algunos artículos a la biónica: el estudio de sistemas mecánicos que funcionan como organismos vivos o como partes de organismos vivos. Hablan especialmente de algunas de las últimas y más avanzadas prótesis e interfaces de control de estas prótesis. Desde retinas electrónicas artificiales que permiten volver a ver a los ciegos hasta brazos y manos robóticas que se adaptan mejor que las mioelétricas tradicionales y que prometen nuevos horizontes para las personas que han sufrido una amputación. En la protésica del futuro la biónica es la palabra clave. Os recomiendo leer el artículo original del National Geographic Magazine: Uniendo Hombre y máquina: la era de la biónica. El cuerpo biónico. Aunque muchos opinan que estos avances aún tardarán en llegar sí son una realidad en los institutos de rehabilitación, universidades y centros de investigación. Más pronto o más tarde llegarán. Además y de forma similar a como solemos hacer en este blog, hacen una mirada al pasado repasando algunas prótesis de la Primera Guerra Mundial como esta que permitía cavar a una persona amputada. Un hombre utiliza un dispositivo para volver a trabajar después de haber perdido un brazo en la Primera Guerra mundial. Electrodos implantados quirúrgicamente están ayudando a Jo Ann Lewis recuperar un vestigio de la visión que perdió hace 60 años. Mientras los científicos trabajan en la interconexión de la máquina y la mente los miembros biónicos están ganando muchas de las capacidades de los seres humanos. Amanda kitts con la prótesis biónica de brazo izquierdo del Instituto de Rehabilitación de Chicago. Amanda Kitts is mobbed by four- and five-year-olds as she enters the classroom at the Kiddie Kottage Learning Center near Knoxville, Tennessee. "Hey kids, how're my babies today?" she says, patting shoulders and ruffling hair. Slender and energetic, she has operated this day-care center and two others for almost 20 years. She crouches down to talk to a small girl, putting her hands on her knees. "The robot arm!" several kids cry. "You remember this, huh?" says Kitts, holding out her left arm. She turns her hand palm up. There is a soft whirring sound. If you weren't paying close attention, you'd miss it. She bends her elbow, accompanied by more whirring. "Make it do something silly!" one girl says. "Silly? Remember how I can shake your hand?" Kitts says, extending her arm and rotat­ing her wrist. A boy reaches out, hesitantly, to touch her fingers. What he brushes against is flesh-colored plastic, fingers curved slightly inward. Underneath are three motors, a metal frame, and a network of sophisticated electronics. The assembly is topped by a white plastic cup midway up Kitts's biceps, encircling a stump that is almost all that remains from the arm she lost in a car accident in 2006. "I don't really think about it. I just move it," says the 40-year-old, who uses both this standard model and a more experimental arm with even more control. "After my accident I felt lost, and I didn't understand why God would do such a terrible thing to me. These days I'm just excited all the time, because they keep on improving the arm. One day I'll be able to feel things with it and clap my hands together in time to the songs my kids are singing." Kitts is living proof that, even though the flesh and bone may be damaged or gone, the nerves and parts of the brain that once controlled it live on. In many patients, they sit there waiting to commu­nicate—dangling telephone wires, severed from a handset. With microscopic electrodes and surgical wizardry, doctors have begun to connect these parts in other patients to devices such as cameras and microphones and motors. As a result, the blind can see, the deaf can hear, and Amanda Kitts can fold her shirts. Kitts is one of "tomorrow's people," a group whose missing or ruined body parts are being replaced by devices embedded in their nervous systems that respond to commands from their brains. The machines they use are called neural prostheses or—as scientists have become more comfortable with a term made popular by science fiction writers—bionics. Eric Schremp, who has been a quadriplegic since he shattered his neck during a swimming pool dive in 1992, now has an electronic device under his skin that lets him move his fingers to grip a fork. Jo Ann Lewis, a blind woman, can see the shapes of trees with the help of a tiny camera that communicates with her optic nerve. And Tammy Kenny can speak to her 18-month-old son, Aiden, and he can reply, because the boy, born deaf, has 22 electrodes inside his ear that change sounds picked up by a microphone into signals his auditory nerve can understand. The work is extremely delicate, a series of trials filled with many errors. 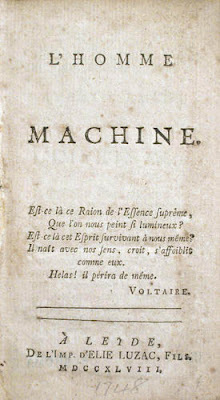 As scientists have learned that it's possible to link machine and mind, they have also learned how difficult it is to maintain that connection. If the cup atop Kitts's arm shifts just slightly, for instance, she might not be able to close her fingers. Still, bionics represents a big leap forward, enabling researchers to give people back much more of what they've lost than was ever possible before. "That's really what this work is about: restoration," says Joseph Pancrazio, program director for neural engineering at the National Institute of Neurological Disorders and Stroke. "When a person with a spinal-cord injury can be in a res­taurant, feeding himself, and no one else notices, that is my definition of success." A history of body-restoration attempts, in the form of man-made hands and legs and feet, lines the shelves in Robert Lipschutz's office at the Rehabilitation Institute of Chicago (RIC). 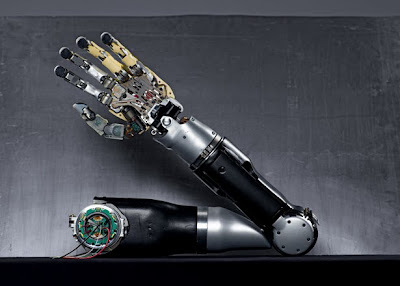 "The basic technology of prosthetic arms hasn't changed much in the last hundred years," he says. "Materials are different, so we use plastic instead of leather, but the basic idea has been the same: hooks and hinges moved by cables or motors, controlled by levers. A lot of amputees coming back from Iraq get devices like these. Here, try this on." Lipschutz drags a plastic shell off one of his shelves. It turns out to be a left shoulder and arm. The shoulder part is a kind of breastplate, secured across the chest by a harness. The arm, hinged at the shoulder and elbow, ends in a metal pincer. To extend the arm, you twist your head to the left and press a lever with your chin, and use a little body English to swing the limb out. It is as awkward as it sounds. And heavy. After 20 minutes your neck hurts from the odd posture and the effort of pressing the levers. Many ampu­tees end up putting such arms aside. "It's hard for me to give people these devices sometimes," Lipschutz says, "because we just don't know if they will really help." What could help more, he and others at RIC think, is the kind of prosthesis Amanda Kitts has volunteered to test—one controlled by the brain, not by body parts that normally have nothing to do with moving the hand. A technique called targeted muscle reinnervation uses nerves remaining after an amputation to control an artificial limb. It was first tried in a patient in 2002. Four years later Tommy Kitts, Amanda's husband, read about it on the Internet as his wife lay in a hospital bed after her accident. The truck that had crushed her car had also crushed her arm, from just above the elbow down. "I was angry, sad, depressed. I just couldn't accept it," she says. But what Tommy told her about the Chicago arm sounded hopeful. "It seemed like the best option out there, a lot better than motors and switches," Tommy says. "Amanda actually got excited about it." Soon they were on a plane to Illinois. In October 2006 Kuiken set about rewiring Amanda Kitts. The first step was to salvage major nerves that once went all the way down her arm. "These are the same nerves that work the arm and hand, but we had to create four different muscle areas to lead them to," Kuiken says. The nerves started in Kitts's brain, in the motor cortex, which holds a rough map of the body, but they stopped at the end of her stump—the disconnected telephone wires. In an intricate operation, a surgeon rerouted those nerves to different regions of Kitts's upper-arm muscles. For months the nerves grew, millimeter by milli­meter, moving deeper into their new homes. "At three months I started feeling little tingles and twitches," says Kitts. "By four months I could actually feel different parts of my hand when I touched my upper arm. I could touch it in different places and feel different fingers." What she was feeling were parts of the phantom arm that were mapped into her brain, now recon­nected to flesh. When Kitts thought about moving those phantom fingers, her real upper-arm muscles contracted. A month later she was fitted with her first bionic arm, which had electrodes in the cup around the stump to pick up the signals from the muscles. Now the challenge was to convert those signals into commands to move the elbow and hand. A storm of electrical noise was coming from the small region on Kitts's arm. Somewhere in there was the signal that meant "straighten the elbow" or "turn the wrist." A microprocessor housed in the prosthesis had to be programmed to fish out the right signal and send it to the right motor. Finding these signals has been possible because of Kitts's phantom arm. In a lab at the RIC Blair Lock, a research engineer, fine-tunes the programming. He has Kitts slide off the artificial arm so that he can cover her stump with electrodes. She stands in front of a large flat-panel TV screen that displays a disembodied, flesh-colored arm floating in blue space—a visualization of her phantom. Lock's electrodes pick up commands from Kitts's brain radiating down to her stump, and the virtual arm moves. In a hushed voice, so as not to break her concentration, Lock asks Kitts to turn her hand, palm in. On-screen, the hand turns, palm in. "Now extend your wrist, palm up," he says. The screen hand moves. "Is that better than last time?" she asks. "Oh yeah. Strong signals." Kitts laughs. Now Lock asks her to line up her thumb along­side her fingers. The screen hand obliges. Kitts opens her eyes wide. "Wow. I didn't even know I could do that!" Once the muscle signals asso­ciated with a particular movement are identified, the computer in the arm is programmed to look for them and respond by activating the correct motor. Kitts practiced using her arm one floor below Kuiken's office in an apartment set up by occu­pational therapists with everything a newly equipped amputee might ordi­narily use. It has a kitchen with a stove, silverware in a drawer, a bed, a closet with hangers, a bathroom, stairs—things people use every day without a second thought but that pose huge obstacles to someone missing a limb. Watching Kitts make a peanut butter sandwich in the kitchen is a startling expe­rience. With her sleeve rolled back to reveal the plastic cup, her motion is fluid. Her live arm holds a slice of bread, her artificial fingers close on a knife, the elbow flexes, and she swipes peanut butter back and forth. "It wasn't easy at first," she says. "I would try to move it, and it wouldn't always go where I wanted." But she worked at it, and the more she used the arm, the more lifelike the motions felt. What Kitts would really like now is sensation. That would be a big help in many actions, includ­ing one of her favorites­—gulping coffee. "The problem with a paper coffee cup is that my hand will close until it gets a solid grip. But with a paper cup you never get a solid grip," she says. "That happened at Starbucks once. It kept squeezing until the cup went 'pop.' "
There's a good chance she'll get that sensation, says Kuiken, again thanks to her phantom. In partnership with bioengineers at the Johns Hopkins University Applied Physics Laboratory, RIC has been developing a new prototype for Kitts and other patients that not only has more flexibility—more motors and joints—but also has pressure-sensing pads on the fingertips. The pads are connected to small, pistonlike rods that poke into Kitts's stump. The harder the pressure, the stronger the sensation in her phantom fingers. "I can feel how hard I'm grabbing," she says. She can also tell the difference between rubbing something rough, like sandpaper, and smooth, like glass, by how fast the rods vibrate. "I go up to Chicago to experiment with it, and I love it," she says. "I want them to give it to me already so I can take it home. But it's a lot more complicated than my take-home arm, so they don't have it completely reliable yet." Eric Schremp, unlike Kitts, doesn't need arti­ficial hands. He just needs his natural ones to work. They haven't done that on their own since Schremp broke his neck in 1992, leaving him a quadriplegic. Now, however, the 40-year-old Ohio man can grip a knife or a fork. He can do this because of an implanted device developed by Hunter Peckham, a biomedical engineer at Case Western Reserve University in Cleveland. "Our goal is to restore hand grasping," Peckham says. "Hand use is key to independence." Schremp's finger muscles and the nerves that control them still exist, but the signals from his brain have been cut off at the neck. Peckham's team ran eight micro-thin electrodes from Schremp's chest under the skin of his right arm, ending at the finger muscles. When a muscle in his chest twitches, it triggers a signal that's sent via a radio transmitter to a small com­puter hanging from his wheelchair. The computer in­terprets the signal and radios it back to a receiver implanted in his chest, where the signal is sent by wires down Schremp's arm to his hand. There the signal tells his finger muscles to close in a grip—all within a microsecond. "I can grab a fork and feed myself," Schremp says. "That means a lot." "I would just hold him in my arms and cry," she says, "knowing he couldn't hear me. How would he ever get to know me? One time, my hus­band banged pots to­gether, hop­ing for a re­sponse." Aiden never heard the noise. "The day they turned on the implant, a month after surgery, we noticed he responded to sound," Tammy Kenny says. "He turned at the sound of my voice. That was amazing." Today, she says, with intensive therapy, he's picking up language, quickly catching up to his hearing peers. Bionic eyes may soon follow bionic ears. Jo Ann Lewis lost her sight years ago to ret­initis pigmentosa, a degenerative disease that destroys light-detecting cells in the eyes called rods and cones. Lately, however, she has partially regained her vision as a result of research by Mark Humayun, an ophthalmologist at the University of Southern California and a company called Second Sight. "We asked them to follow a dot, and they could," he says. "They could see rows, and they could see columns." After another decade of testing, Humayun and his colleagues devel­oped a system they dubbed Argus. (Greek myth­ology. A giant. Hundreds of eyes.) Patients got a pair of dark glasses with a tiny video camera mounted on them, along with a radio transmitter. Video signals were beamed to a computer worn on a belt, translated to electrical impulse patterns understood by ganglion cells, and then beamed to a receiver resting behind the ear. From there a wire took them inside the eye, to a square array of 16 electrodes gently attached to the retinal surface. The impulses triggered the electrodes. The electrodes triggered the cells. Then the brain did the rest, enabling these first patients to see edges and some coarse shapes. In the fall of 2006 Humayun, Second Sight, and an international team increased the electrodes in the array to 60. Like a camera with more pixels, the new array produced a sharper image. Lewis, from Rockwall, Texas, was among the first to get one. "Now I'm able to see silhouettes of trees again," she says. "That's one of the last things I remember seeing naturally. Today I can see limbs sticking out this way and that." Not everything will work perfectly. One of the four initial BrainGate patients decided to have the plug removed because it interfered with other medical devices. And Jo Ann Lewis says her vision isn't good enough for her to safely cross a street. Today, however, Kitts has a new, more elastic cup atop her arm that better aligns electrodes with nerves that control the arm. "It means I can do a lot more with the arm," she says. "A new one up in Chicago lets me do lots of different hand grasps. I want that. I want to pick up pennies and hammers and toys with my kids." These are reasonable hopes for a replacement part, Kuiken says. "We are giving people tools. They are better than what previously existed. But they are still crude, like a hammer, compared with the complexity of the human body. They can't hold a candle to Mother Nature." Josh Fischman is a senior editor for research and technology at the Chronicle of Higher Education. Mark Thiessen is a Geographic staff photographer. En fin, si todo esto os plantea alguna duda filosófica o moral, pues plantearos que el hombre está hecho de barro, o mejor dicho, de la misma materia que el resto de las cosas. Somos polvo de estrellas, nuestros átomos no son diferentes de los átomos que forman a los animales, el cuerpo humano no es demasiado difente a cualquier otro cuerpo orgánico y podemos entenderlo como si se tratase de una máquina orgánica. Por ese motivo podremos unir el cuerpo a órganos biónicos. Esta verdad: el cuerpo es materia, sigue siendo más dramática para la mayoría de las personas que el hecho de descubrir que es la Tierra la que gira alrededor del Sol y no el Sol que que gira alrededor del hombre. Si alquien quiere saber más puede buscar el libro "El hombre máquina" de Julien Offray de La Mettrie, del siglo XIIX. y a partir de ahí toda la discusión entre materialistas y vitalistas. Publicado por Unknown en 1/05/2010 01:21:00 a. m.